Just a picture of a river. A river in flood stage. Even a river with a wide flood plane can be dangerous when it is in flood stage. Fast current. Cool water in the spring. Branches that were well above the paddlers’ head at normal water levels now become flow-throughs. Rivers such as the upper Des Plaines, with its many twists and bends and low branches, can be especially dangerous. We want to get out and paddle – but we want you around for the next newsletter. Please use caution. Here are the steps that went into what became a U-Turn paddle trip this afternoon. Right from the beginning, we noticed the river had changed. Different channels. Trees down. There was significant flooding in December and several high-wind events and an ice storm since we paddled this section last fall. First steps in risk management were not paddling solo; dressing for possible immersion; going with someone intimately familiar with the river. We approached each potential problem area cautiously, such as when we were about to round a corner. If a spot looked tricky, we discussed which line/route looked best before committing. When we got to the final obstruction, we checked various options. The only possible spot to cross was in the middle, but we could see a log just below the surface that looked likely to prevent us from crossing, and potentially could flip us. The water around the tree was fairly deep. We might have been able to climb out on the branches but if we fell, there was danger of being trapped under the downed trees. Even if we got over the obstruction and got our boats over the obstruction, relaunching on the other side looked dicey. Even if we could get back in our boats on the other side, we already had encountered many changes in the river, and there was no telling what was ahead. Thanks to a GPS we had with us, we knew we’d only traveled a little more than a mile and figured turning back was still reasonable and feasible. On our return trip, we moved very cautiously in one of the other deadfall places, and we had to get out on a gravel bar and drag our boats around a shallow area where current funneled through narrow spots. You can’t get enough “bite” with your paddle in shallow water to counter the current. We knew there was another tricky, shallow part we had maneuvered through shortly after we put in. I already knew of a previously scouted place we could take out and still drag our boats back to the parking lot. In our last newsletter, we included an editorial by Don Mueggenborg regarding the mandatory use of PFDs. The article received the highest “click” rating of all articles in the newsletter, an indication of its interest to many of you. We also received a few comments or rebuttals from readers, and would like to share these with the rest of the TIP audience. Thanks to the authors for sharing their thoughts with us. One more thing to add to your list. The situation you first described (90 degrees on a humid day) would be a time when wearing the PFD could lead to hyperthermia and/or dehydration. Good luck with this. The state has a way of missing out on common sense solutions. I think of this when I am driving in the safest vehicle ever made (air bags deploying in all directions of impact, shoulder harnesses, collapsible frame, safety glass, autobraking, etc.) and a motorcycle goes by, the driver not helmeted, wearing a t-shirt, shorts, and flip-flops. He is fully in compliance with the law, yet, if I don’t have my seatbelt fastened, I am at risk of getting a $75 ticket. Go figure. I would like to respond to Don Mueggenborg’s editorial regarding mandatory PFD’s that ran in a recent issue of The Illinois Paddler. In it, Mr. Mueggenborg voices his opposition to a proposed Coast Guard requirement mandating that PFD’s be worn at all times by all boaters. He supports his position with several arguments. While I understand – and in some cases agree with – his arguments, I disagree with his conclusion. Mr. Mueggenborg’s arguments seem more applicable to skilled, experienced paddlers than to the entire spectrum of paddlers. Many of his points are perfectly valid for skilled paddlers, but far less so for the kind of unskilled paddlers that we frequently see ricocheting from bank to bank with no PFD but plenty of beer. Since there cannot be separate sets of rules for the different types of paddlers, any rule must, of necessity, be one-size-fits-all. Unfortunately, it must also take into account the least common denominator: in this case, all paddlers, regardless of skill level. I understand his argument that when paddling in six inches of water, a PFD would be of limited value. In such a river, however, there is probably no greater hazard than a strainer, and a strainer that has been there for a long period of time is likely to have scoured out the river bed beneath it. That six inch depth suddenly becomes six feet or more. We are all aware that this can happen and (hopefully) have the reliable skills that we need to avoid it. Unskilled, inexperienced paddlers are at far greater risk. In the situation when they most need flotation, they may not be wearing a PFD. This was a contributing factor to the last three deaths at the Glen Palmer Dam – a hydraulic rather than a strainer, but PFD’s would still certainly have increased their chance of survival. Even absent the possibility of unforeseen deep spots, leaving to the judgement of the paddler the decision whether or not a PFD is advisable empowers inexperienced and sometimes impaired paddlers to make that decision. Water that is uniformly six inches deep is a pretty easy call. But some may think that two or three feet is shallow enough, not taking into account the current and having no concept of a foot entrapment. Some people will undoubtedly think that they can swim well enough to never need a PFD, not taking into account the possibility of a shoulder injury, a head injury or a medical episode that results in unconsciousness. Again, experienced paddlers usually take all of this into account, but since any rule must apply to all, it must take into account the needs and deficits of all paddlers. Leaving it to the discretion of the individual paddler pretty much guarantees that people with poor judgement will exempt themselves from wearing a PFD. Mr. Mueggenborg cites the records of the DesPlaines Marathon and the USCA. He states that there have been no incidents at any of their events. If that statistic is accurate, that is testament to their focus on safety and is not applicable to paddling in general. Further, while there may or may not have been any fatalities in these venues, I doubt that close calls or other such incidents are even reported. Finally, while the USCA does not require that PFD’s be worn at all times during events sanctioned by them, they do require that they be worn at all times if the event organizer deems it advisable. My suspicion is that most event organizers do require that PFD’s be worn, making this an argument in favor of mandatory PFD’s, rather than against it. This same kind of debate raged in the 1970’s, when the Legislature debated mandating that seatbelts be worn in motor vehicles. Those who opposed the requirement argued that the Legislature would be infringing upon their personal freedom and pointed to the possibility – however remote – that a driver could be trapped by his seatbelt in a car that was burning or sinking in a pond. The Legislature enacted the law and highway deaths fell. With the paddling community being much smaller than the motoring public, we will see a much smaller fall, but it is hard to argue that no lives will be saved by requiring that PFD’s be worn while paddling. And like seatbelts, if you are not wearing it when you don’t need it, you won’t have time to put it on when you desperately do need it. The decision that the Legislature made in the 1970’s and that the Coast Guard is making now is not designed around any particular segment of the population, it is designed to serve the public at large. Some will argue that paddlers have the right to decide whether or not to put themselves at risk, but their decision has far-reaching consequences for the public. If someone dies on the river, there are frequently survivors who will receive Social Security survivor benefits, Medicaid, etc. If the paddler doesn’t die but is deprived of oxygen for too long, he may be eligible for Social Security SSI, Medicaid and other benefits at great public expense for decades. These decisions are not entirely personal and should not be left entirely to the individual. The government has an obligation to balance the public interest against the rights of the individual. The Coast Guard currently has the unenviable job of looking for a reasonable balance, knowing that there will be some on both sides who feel that their rights have been trampled. That was true during the seatbelt debates, and will likely be true for any future similar debate. In the end, it will not bother me if the Coast Guard requires PFD’s. I am never without mine, even in warm weather and shallow water. I also wear my seatbelt, regardless of how slowly I am driving. If, however, the Coast Guard decides in favor of some lesser requirement, I will accept their decision as having been made in the interest of public policy. I hope that others will do the same, and that it doesn’t descend into the histrionic rhetoric we saw during the WUS debate. This note is in response to Don Mueggenborg’s October 1 online Editorial regarding a potential regulation for mandatory PFD wear as it pertains to paddlers. I have not heard of any such pending action from the USCG, so I suspect what was heard may be rumor. If there are any references to a request for comment for a pending or proposed regulation, I’d be very interested in seeing it. Beyond the legalities involved, I would still disagree with the editorial. PFD’s should be worn at all times by paddlers and in all situations. The analogy is akin to using a seat belt in a car. Not using a PFD in shallow water is like saying that one should not use a seat belt when driving in their driveway. The chances of injury are low, but anything can happen, and the cost of the insurance is almost nothing. If one becomes incapacitated walking down the street, one may end up laying on the ground until help arrives. If one becomes incapacitated in water, even shallow water, drowning and hypothermia are real dangers. Millions of people wear seat belts in their cars every day and don’t get in a crash. They wear them for that one time – where the unlikely and uncommon event happens. PFD’s serve the same purpose. One of our new River Stewardship Volunteers for the Lake County Forest Preserves asked this very important question: “I was thinking about going on this clean up, but I was wondering how to dress for canoeing when it is cold out. Is it possible to be warm?” At this time of year, it’s always good to review this fundamental question. Cold water exposure will rob your body of heat many times faster than air at the same temperature, and can cause a person to go into hypothermia very quickly. This is a critically serious medical condition, and can be fatal in a short time frame. It’s that serious. The key to this, that some people don’t really understand, is that you must dress for the water temperature, NOT the air temperature. The difference between air & water temperature can be huge: a balmy late fall or (especially) early spring day can have 75 degrees air temperature, but the water temperature can be a frigid 35. Water that cold will render mere humans unconscious in minutes. Thus, the most critical factor for cold weather paddling is staying dry. Fortunately, there are some very good options to keep you dry, though they’re not cheap. A low-end dry suit costs more than $500, and is thus out of reach for a lot of people. But it will keep you pretty dry, even if you fall into the water. Here’s one example: http://www.rutabaga.com/kokotat-supernova-paddling-suit Higher-end versions will include more features, such as “relief zippers,” allowing the wearer to use the bathroom without completely disrobing. You can also get dry pants and a dry top, or “semi-dry” pants and top. These 2-piece systems typically run a bit less cash than a full dry suit, and are easier to get into and out of. That’s what I use. Both of the options above can be worn with as many layers of insulation (long underwear, fleece, NOT COTTON) as you can fit inside the outer layer. With both of these options, though, being able to adjust the number of layers you’re wearing is not easy, so knowing how much insulation you need is pretty important. And remember that your PFD, worn outside the dry suit/top, is a good insulating layer for your upper body. The next best thing is a neoprene wet suit: http://www.rutabaga.com/nrs-mens-radiant-wetsuit. These don’t keep you dry, but they fit tightly to your skin, so if you do fall into the water, only a small quantity of that cold water gets on your skin, and it warms quickly. These work okay if you only get wet once, but every time you get out of the water, the water inside the wet suit drains out, and if you get in the water again, it gets replaced by cold water… multiple dunkings can be deadly. You can wear as many layers of warm clothing on top of the wet suit as you like, but don’t wear anything underneath the wet suit. Doing so defeats the purpose of the wet suit. For less extreme conditions, the dry or wet suit options may not be necessary. Defining what are “less extreme conditions” is largely a personal matter… if you tend to feel cold when others still feel warm, you will want to use these top-level options at different air temperatures than someone who is less sensitive to feeling cold. But again, dress for the water temperature, not the air temperature. For insulating layers, cotton is to be avoided at all costs, from undergarments all the way to the outer shell.. Once cotton gets wet, it stays wet, and the water that got it wet is cold. The best insulating layers are synthetic materials, such as nylon, polypropylene, or synthetic “fleece,” all of which don’t hold water well, and dry quickly. Beyond the insulating layers, a windproof shell, often nylon (but again, NOT COTTON), is a great addition, as it will keep the wind from replacing warmed air in the insulating layers. That’s where the dry suit or dry pants & top are at their best. It’s important to note that footwear like this is pretty good at protecting your feet from the various sharp objects (broken glass, rusted metal, fish hooks) that we often find in the rivers, but you can’t rely on them being waterproof. Dry pants have “feet” built into them, so you can wear a lot of warm socks inside the dry pants, and wear the boots over the dry pants “socks.” It works well. Neoprene gloves can feel a bit thick on your hands, but they’ll stay warm, even if you get water in them. They’re kind of like a wet suit for your hands. Always ALWAYS ALWAYS have a dry bag with spare clothing, a fleece towel, and a “Space Blanket” to wrap yourself in. If you do get wet, despite all the precautions, you’ll want to get warm & dry as quickly as possible. If you show up for a cold weather paddling trip wearing inappropriate clothing, and/or without a dry bag with spare clothing, don’t be surprised if you’re asked to leave. Your failure to prepare jeopardizes the safety of the rest of the group. Nobody likes a chain with a weak link, and you’d be the weak link. This all represents a significant investment in specialized clothing, and each individual needs to make their own choice. What it really comes down to is your personal decision regarding what are your limits, your “comfort zone,” and whether you dress appropriately for those conditions. Remember, cotton kills. Remember that NOBODY is expecting anyone to paddle outside their comfort zone. If you think it’s too cold for you to go canoeing, that decision must be respected, with no exceptions. I’m comfortable canoeing down to somewhere around 25 degrees, but most people are happier with a warmer air temperature. And remember, the water temperature can be really cold! Be very careful if you decide to push your personal limits. Paddle with a group of experienced people who know the particular river you’re on, are prepared for the possibility of immersion, know how to recognize hypothermia, and know how to deal with it. Keep an eye on your map, so you can figure out where to tell the paramedics to find you. Last time I checked my local services, they don’t work off GPS coordinates; they need addresses, or road names & traditional map locations, like “We’re on Rte 173, half a mile east of Rte 41.” And a GPS may not work well when the batteries get cold. A little controversy – anyone want to contact the editor with a rebuttal? As I paddled the Lower DesPlaines in 95 degree weather, my paddling hitting bottom on every stroke, I wondered what reasons I could give to show that one size does not fit all. That mandatory, meaning all the time, in all conditions, is a bad idea. Then I realized that I had the answer, my paddle was hitting bottom – the water was so shallow that if I were to tip, I could reach down with one hand and right myself. If I fell in, I wouldn’t get my ankles wet. The river isn’t even one hundred yards across so I could get to the bank. Then I began to wonder where we could find the answers to the questions that arose in my mind. I began to question the statistics. How many paddlers died on rivers in Illinois? Where did the accidents occur? How many of these would not have died if they were wearing a PFD. (If you are hit by a motor boat speeding 30 mph, your chances are pretty slim whether you have a PFD on or not). How many of these involve alcohol or drugs? Most statistics lump all watercraft accidents together – not separating the paddlesport craft. You can see where I stand on mandatory wearing of PFDs. One size does not fit all! I respect those who feel that everyone should wear a PFD at all times when on the water in a canoe or kayak. If you feel better wearing a PFD, by all means wear it. There certainly are times when a PFD should be worn. The Des Plaines River Canoe Marathon – a citizen race with most of the paddlers not people who race more than 1 or 2 races a year and race with cruising boats. The race has been going on for over 57 years (some years we required wearing PFDs, so let’s cut it down to 50 years) – average 500 boats a year over that time – 25,000 paddlers – no incidents. The USCA and Paddlesport insure races all over North America – in the 20 or 30 years they have been insuring paddlers – no incidents. We might be better off making sure our PFDs work and that we can still swim, if we haven’t been swimming in a while. My side of the argument – this is what I would present if a bill ever comes up. Any comments? Feel free to send thoughts to the IPC newsletter editor at news@illinoispaddling.org. And no, one does not need to paddle the 5.5 miles off-shore from Glencoe to view this buoy data. After all, the purpose of this and other buoys is to enhance safety for recreational and commercial users of the lake before, rather than after, they find conditions to be treacherous! 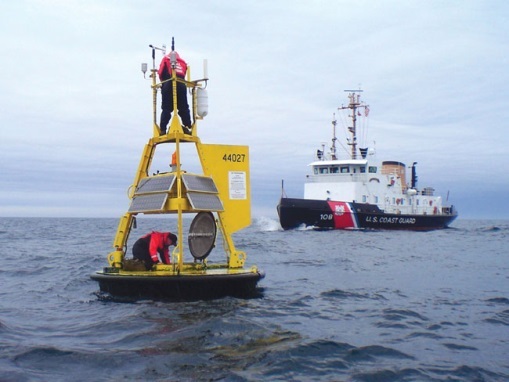 The necessary data, and that from other buoys, can instead be viewed on-line at the National Data Buoy Center www.ndbc.noaa.gov (search for station 45174) or www.greatlakesbuoys.org. Note that the website calls this site “Wilmette”, probably because nearby Wilmette Harbor is more commonly known among the Lake Michigan boating community. Give it a try! As the buoy number “45174” implies, there are thousands of these weather buoys in strategic locations around the world. Some even have buoy-camera ability to display on-line a photo of water conditions at the site of the buoy, but I have not yet been able to do this with the Glencoe (Wilmette) buoy. Neither does the buoy have the ability to take a “selfie,” so we have instead included a photo of a typical Lake Superior buoy with two maintenance workers aboard! And, where do these buoys go in the winter? While like most paddlers, the buoys would prefer a southern vacation, many (including 45174) are instead removed for the season to escape the battering winds and ice-packed waves! A fast current – a good ride. You go flying down the river faster than you ever have. June 2015. The spring season was wet. There was rain almost every other day. The Des Plaines River Canoe and Kayak Marathon had rain forecast, but the rain held off until after the race. The Mid-America Canoe Race had a downpour right before the start, but after a 20-minute lightning delay, the rain stopped and the day was great. But it continued to rain on and off. Then on the night of June 15, it poured. Some areas got 4 or 5 or even 6 inches of rain. Rivers rose higher than they had been all spring. The Fox River was closed. Yellow tape closed parts of the Naperville Riverwalk. Time for caution! In fact, we marveled at the fast current flowing through overhanging branches while at the riverwalk. I had never seen the DuPage so high and fast. If I understand correctly – 3 people rescued Tuesday from the DuPage in Naperville – Three more on Wednesday and another on Thursday. Rescuers were put at risk because some people did not use good judgement. In high, fast, and/or cold water, always wear a PFD. When the rivers rise, tree branches that were high over the river now become flow-throughs (strainers). Water goes through the branches, you do not! With fast current, you do not have the control you have at a normal river level. You cannot avoid those branches. Small inflatables are not whitewater quality and are not intended for use in whitewater or fast water. It seems to be the rule, the fastest current always brings you into the overhanging trees. When you get heavy rains, narrow streams like the DuPage River in Naperville will rise fast – while streams with a wide flood plain such as the lower Des Plaines tend to rise slowly. If you want to paddle after a heavy rain, stay away from narrow streams. Every year in Illinois, between the organized club trips, meetup groups, friends getting together, etc. there are lots of people on lots of different waterways! And for the most part everyone has a great time! After all, the worst day paddling is better than the best day at work! And then just once, out of all those many hours spent on the water, something goes wrong. Someone steps wrong and sprains/breaks an ankle. Someone stumbles, reaches down to break their fall, and breaks a wrist. Or dislocates a shoulder…or…or…or… So what happens when someone gets hurt? Would you be ready to deal with the situation? Advanced preparation and training is essential. Depending on the context you are in will depend on the first aid training and skills you will need. In a context where Emergency Responders are readily available to help, first aid as taught by the American Red Cross and American Heart Association (amongst others) is appropriate. This type of training focuses on dealing with stabilizing critical life threatening issues and waiting for professional help to arrive. In a more remote context, where emergency assistance is day(s) away, Wilderness First aid as taught by Wilderness Medical Associates, Outward Bound, (amongst others) is appropriate. Once you have had the first aid training you will be ready to put together an emergency kit. Not only will this involve first aid supplies, but it might include other things as well. Think through some likely scenarios that might happen and plan in advance for how to handle them. What will you need if someone gets hypothermic and needs to warm up? what will you need if someone damages a boat? What will you need if someone loses a paddle? What will you need to signal for help? What will you need if someone needs to mark walk out and mark a trail back to the rest of the group? What if you get stuck out and have to spend the night? The kit will probably vary based the type of paddling, time of year, location, etc.